The Global Property Guide looks at inheritance from two angles: taxation, and what inheritance laws apply to foreigners leaving property in Finland: what restrictions there are and whether making a will is advisable. How high are inheritance taxes in Finland? The beneficiaries of the deceased are liable to pay inheritance tax on their portion of the estate. The net estate is valued according to the fair market value of all the assets at the time of death. The tax is levied on the beneficiary's share of the estate. All gifts received by a beneficiary from the deceased three years before the time of death are added to that beneficiary's taxable inheritance. However, gift taxes paid on such gifts may be credited against the inheritance tax due. The rates of the inheritance tax, and also the gift tax, vary according to the share of the beneficiary in the estate and the proximity of the relationship between the deceased and the beneficiary. Beneficiaries are divided into two categories, depending on their relationship with the deceased. The spouse may deduct €60,000 from his inheritance as personal allowance. Any lineal descendant under 18 years of age may deduct €40,000 if he is the closest beneficiary of the deceased. What inheritance laws apply in Finland? Finnish inheritance laws apply to all real property located in Finland. The law applicable to real estate, according to Finnish law, is the law of the country where the real estate is located. Finnish law also applies to the movable property of any persons who had permanent residence in Finland at the time of death, or belonging to persons of Finnish nationality. 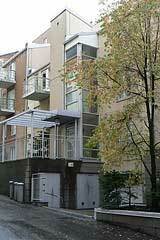 As regards movable property, Finnish law is applied, where the estate is executed and distributed in Finland. But if the deceased is living abroad at the time of death, his/her permanent residence may rule the applicable law, and the Code of Inheritance forbids in principle the return of jurisdiction back to Finland. It is therefore possible for different laws to be applied to two spouses of different nationalities. It is also possible in some cases to determine beforehand the applicable law, if the same formalities as with Wills are met. The religion of the deceased has no significance. Usually, the estate is divided and the inheritance is administered by the heirs themselves. But in the event of a dispute relating to the estate, the local District Court handles inheritance issues. The District Court of the place where the real estate is situated always has authority to decide the case, though with regard to movable property, the last residence of the deceased determines which court has the power to decide the case. Inheritance cases are normally tried by the District Court (which only handles inheritance cases) in approximately 6-18 months. In some cases, the District Court may appoint an administrator, usually a private attorney, upon request of a shareholder in the deceased's estate, to handle the inventory and distribute the inheritance. Direct descendants have the right to a reserved portion - half the estate. Half of the estate is reserved for shared distribution between direct descendants. For example, if the deceased had two children, who would normally inherit the whole estate, but he/she made a will that gave everything to a third party, then the children still receive one half of the estate, that is one quarter for each child. The residue of the estate can be freely willed to anyone. It is normal to make a will in Finland. It is often advisable to make a will in Finland. If a married couple has children, the spouses should make a will for the benefit of each other, because children inherit everything if there is no will. A will must be in writing, with two witnesses simultaneously present. If this condition is met when a will is signed abroad, then there is no requirement for presence in Finland. In the case of intestacy, i.e., where there is no will, the children get the whole estate, though the spouse is protected. Notwithstanding a demand of a direct descendant for the distribution of the estate, or the rights of a beneficiary under a will, the surviving spouse may retain possession (not ownership) of the undivided common home or of other housing that is part of the decedent's estate and suitable as a home for the surviving spouse, unless there is housing suitable as a home for the surviving spouse in his or her own property ( in Finland as a general rule spouses have their own property despite the marriage). It is also possible that a marriage settlement exists, which means that the position of the spouse can be quite weak in some cases. A surviving spouse may also be entitled to compensation, depending on the circumstances. If there is no spouse or children, the parents inherit everything. If the parents are already deceased, their other children (the brothers and sisters of the deceased) and their children inherit everything. If there are no relatives at all, the state of Finland receives the whole estate. Property can be freely given to anyone, during the lifetime of the owner. Despite the rule that property may be freely gifted, a gift of property could be interpreted as an advancement if received by a direct descendant. In this case, the value of the gift is deducted from the inheritance. If a gift is received by a non-direct descendant, or by a non-related third party, the legal assumption is that the gift is not an advancement. Such a gift is not usually open to challenge; however, because of the marital rights system, a common home can not be gifted without permission of the other spouse. The public register is decisive in determining who owns real estate. In the event of a dispute over the ownership of property in Finland, the District Courts refer to the public register of real estates and their owners. The conveyance of real estate depends on certain formalities, and is not valid if these formalities are not complied with. The conveyance is also verified by a public notary. The public authorities may appoint a guardian, where minors are the inheritors. If property in Finland (or part of it) goes on death to a child, or children not of legal age, or to others not legally adult, the public authorities must appoint a guardian for the minors if both parents are deceased (and the guardian cannot be freely appointed by will of the deceased). If the other parent is alive, he / she is under the law the guardian as a general rule. How high is income tax on residents in Finland?